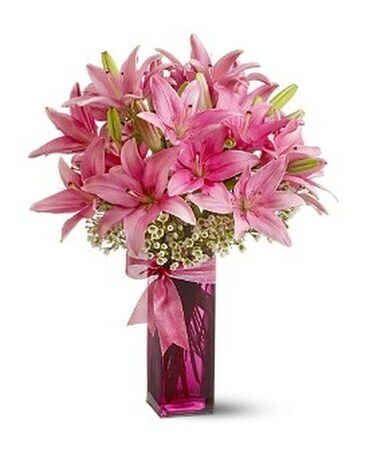 This bright bunch of pink Asiatic lilies nestled in a base of tiny white blossoms is showy, fragrant and fabulous! This bright bunch of pink Asiatic lilies nestled in a base of tiny white blossoms is showy, fragrant and fabulous! Delivered in a plum-colored vase with a pink satin bow, it's an elegant gift for any day of the year.